It's 03:04 in Sidney, USA right now. I-95 Southbound Near Milepoint 119.2 A view of the current traffic. 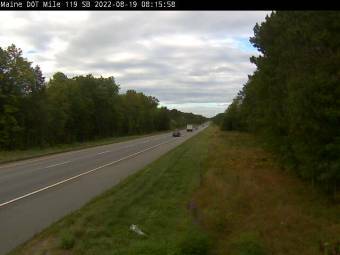 Waterville, Maine: I-95 Southbound Near Milepoint 128.2, 8.2 miles away. Waterville, Maine: Waterville Senior High School, 8.2 miles away. Richmond, Maine: I-295 Richmond Southbound, 25.5 miles away. Damariscotta, Maine: Panorama View, 30.7 miles away. Wiscasset, Maine: US Route 1 Southbound at Birch Point Road, 31.2 miles away. Edgecomb, Maine: US Route 1 Southbound at Route 27, 34.5 miles away. Newport, Maine: I-95 NB Northbound Milepoint 159.1, 34.5 miles away. Bristol, Maine: Pemaquid Point Cam, 35.8 miles away.